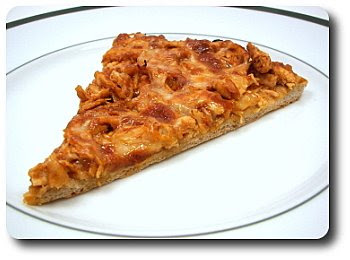 If you just glance at the recipe for this week's Friday Night Pizza, Pulled Chicken Pizza, it may look fairly lengthy and complicated. Don't let that fool you though, it's not difficult nor does it take forever to prepare, especially since I was able to get everything together while the homemade whole-wheat dough was off rising! 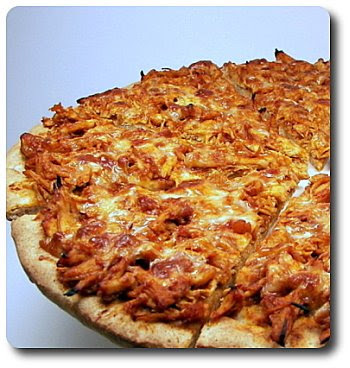 The chicken eventually goes into a saucy dip before being scatted onto the pizza, but we wanted to give it as much potential as possible. Rather than just salt and pepper, a gentle-spiced smoky rub composed of dark brown sugar, smoked paprika, chili powder, cumin, chipotle chile pepper, salt and a touch of ground ginger was dusted over a pound of chicken thighs. Rubbed into all the nooks and crannies of the dark meat, this mixture does have a little bite to it, but nothing more than just a tingle thanks to the sweet contrast. Grilled to cook through, the juicy thighs were set aside to cool while I kept myself busy preparing the sauce. To a bit of finely chopped onion, softened of course, we mimicked some of the same spices as the above rub so the chicken and sauce would meld well, but we wanted to hit a few other notes. You'll find the same dark brown sugar and chili powder, but this time a bit of garlic, dry mustard, allspice and cayenne went in, along with ketchup, broth, cider vinegar (for that tang you expect) and just a drizzle of molasses for a robust snap. Somewhat loose right off the bat, the sauce was brought to a boil, then turned down to simmer to tighten itself up so it would cling to a spoon, but still have some flow to it. By now, the dough was almost ready to work with and the chicken had cooled down enough to easily shred to pieces. Which meant it was ready to jump into the sauce to get thoroughly coated! As this is a fairly moist topping, once the dough had been stretched out, we slid it onto our well-used pizza stone to ensure it would hold up - you are not looking to cook it completely, just long enough to begin crisping up. Flipped over, the saucy chicken was smeared over the golden top, then scattered with mozzarella cheese - add as much cheese as you like as we were fairly conservative... we were looking for the filling to shine more than the cheese this time! Baked once more to finish off the crust and melt the cheese, figure in a few minutes resting time to give the sauce coating the chicken a chance settle before you slice in with your pizza cutter (though we use one of those fancy pizza rocker blades as it makes life easier and works well for bar cookies too!). A good marriage between sweet and spicy, the combo of lip-smacking sauce and seasoned chicken definitely did not disappoint and was a fun way to top off a pizza! If you are not into dark meat, you could use chicken breasts instead, but do note you'll want to keep a closer eye on them during grilling to be sure they are still plenty moist. Double the recipe and use half of it to make the pizza one night, then use the leftover sauced meat a day or two later in a few toasted buns, with your favorite add-ons, for a wicked good sandwich! 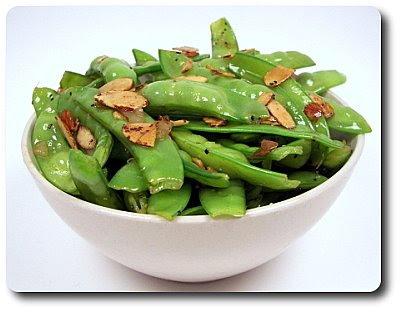 Just like that steak salad with snap peas, we prepared this Snow Peas with Toasted Almonds side dish a few weeks ago when we snatched the first harvest from our pea plants. However, I just made this again tonight because they are giving us a second harvest (along with the snap peas!) and we couldn't pass up the chance to repeat it. Instead of taking the sliced nuts and toasting this separately, we completed two tasks at once by tossing a knob of butter into a skillet and melting it down, along with the almonds, and letting them each turn golden and nutty. Before we get any further, I do have to say it is quite hard to go wrong with browned butter and with this alone as our starting off point, I knew this one wasn't going to disappoint. Our trimmed snow peas and a touch of minced shallot, for its mild onion-y bite, were then stirred in and allowed to briefly cook to soften the shallot and heat the peas through. Just before serving, we refreshed the vegetable with a bright note by stirring in a splash of fresh lemon juice. 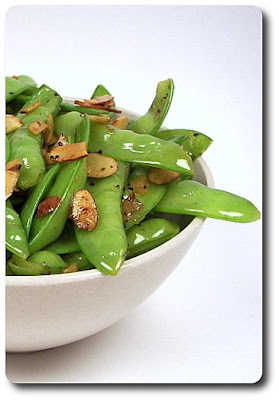 Even though there was only six ingredients, including the salt to season, this quick, glistening vegetable side took a simple snow pea and elevated it with complex browned butter and toasted almonds. With the freshness dancing away in our mouths, this just reinforced the idea that less is more and it will be one of my fresh, go-to sides during the spring and summer seasons. Malt goodies ride the line as one of Jeff's favorite items and with that in mind, I chose these Vanilla Malted Cookies to make as this week's Wednesday Treat Day! The malt powder goes into the dry ingredients, which is just flour, the malt powder, baking powder and salt - I usually have two kinds of malted-milk powder stocked in the pantry, both chocolate and plain, as they are wicked good as ice cream toppings (or of course, to make shakes!). 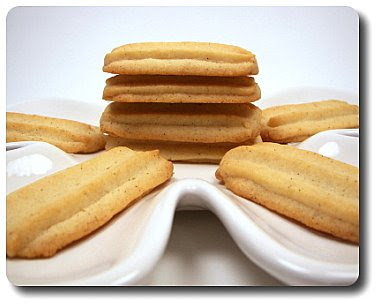 These cookies use the plain though, allowing the malt flavor to take precedence. While butter is used in the dough, to give the cookies a tender quality, a few ounces cream cheese is also thrown in mix. Flecking the batter with black dots, fragrant seeds scraped right from a plump vanilla bean were added with the sugar to be evenly distributed. Don't throw away the almost empty pod though - stick it in a resealable container filled with granulated sugar and let the pod permeate through, making your own jar of delicate vanilla sugar! While the seeds are powerful on their own, since the malt is no slouch and packs a wallop, we backed up the vanilla with a half teaspoon worth of vanilla extract to be sure its flavor didn't become lost. The dough is somewhat stiff and on the stickier side when fully combined - to bang the cookies out, the dough is scooped into a sturdy pipping bag and squeezed out using a large open star tip (I used an Ateco tip number #825). They do spread slightly, but nothing too crazy, so the cookies don't have to be far apart - about 1" between the strips is good. When baking, you want the tops of the cookies to gain just a hint of color, while the edges around the bottoms should become golden brown. 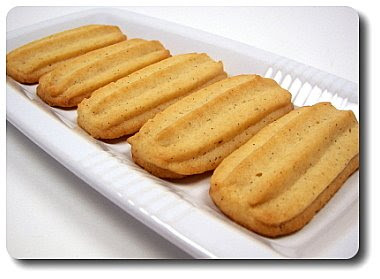 When cool, the cookies have a texture somewhat resembling shortbread - sturdy, a little crumbly when you bite into them, yet still tender enough that they melt in your mouth. A bonus for these cookies is the fact they are not overly sweet - just enough sugar for structure and enhancement without becoming cloying. While I did talk about not using chocolate malted powder, if you can't find yourself satiated without a touch of chocolate, I could be swayed to dunking just a portion of the cookie in melted bittersweet chocolate to take these over the top (and gain a striking contrast to the blond? cookies!). 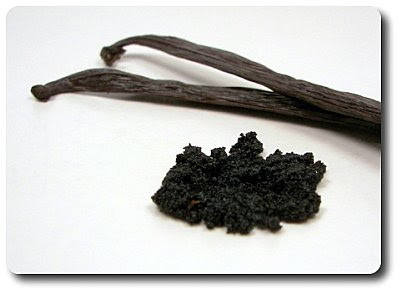 I know vanilla beans are expensive (just over $7 for three when we went to pick them up at our local Penzey's store), but I don't suggest leaving them out if you want the full experience. I think those intense seeds are needed to cut the pungency of the malt, but you could always try using a bit more extract if you'd rather not spend the extra money. 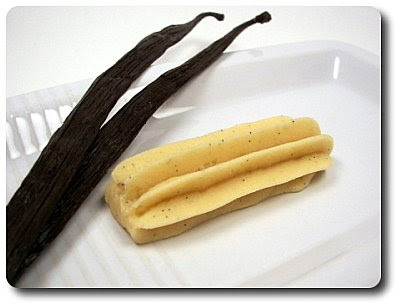 Or, if you happen to be so lucky, instead of using the extract and bean, you could try using vanilla paste, which is a concentrated extract laced with vanilla seeds. With six new recipes coming out from our kitchen this week, our favorites this round were those Chipotle Chicken Skewers With Creamy Cilantro Dipping Sauce, that tangy Strawberry Sherbet and the Egg and Bacon Pizza. The first-of-the-season Minnesota grown corn has started to trickle in and you can be sure we wasted no time taking advantage of those sweet cobs. 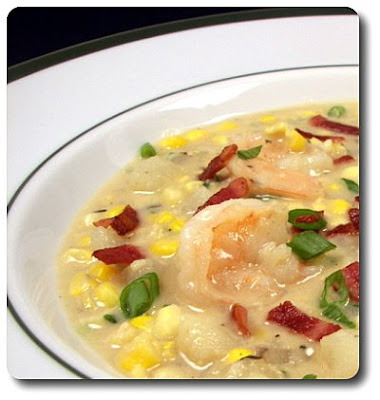 While it was tempting to just grill the ears and chow down on them with a little lime, chipotle and butter, Jeff had been asking for a shrimp dish again, so we opted to use what we had in this Corn-and-Shrimp Chowder with Bacon. Before we dive into the cooking, I wanted to give a little nod to the preparation of the corn. After stripping the cobs, I was pleased to see this recipe takes the extra step to scrape the milk and pulp off each cob once they were cleaned of the kernels. Why bother? Besides draining the corn of every darn inch of flavor it has, the pulp adds to the texture of the soup, thickening the base without having to use too much extra flour. 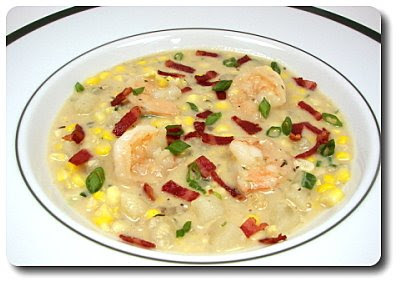 Give it a try with your next soupy dish that has corn and see the difference! To get this soup goin', we sliced up the smoky bacon for this chowder and let it render down to crisp it up, as well as to leave us with some drippings to begin cooking the whites from a couple scallions and cubed potatoes that were coming in next. To keep that bacon crunchy though, it is removed and reserved for later. Flour was sprinkled in to give it time to cook out its raw taste, but remember we don't need very much at all - just a couple tablespoons for the whole pot. Milk and vegetable broth, along with Cajun seasoning (you could certainly used a seafood seasoning if you like) and thyme, were tossed into the mix, adding volume and creaminess. Those added liquids will first be brought to a boil to ensure the flour is heated enough to work its magic, but then the chowder needs to simmer long enough to finish cooking the chunky potato pieces through. The kernels of corn, along with those smart scrapings from the cob, are tossed into the pot and once given a chance to warm through, we stirred in the peeled shrimp and a portion of the greens from the remaining scallions. Ready in just minutes, as soon as you see the shrimp pink up and they turn just opaque, we removed the chowder and gave it a quick re-season before ladling out into the bowls. Bringing the bacon back home by sprinkling the crispy bits and adding a few more green scallion slices on top, we were both pretty anxious to slide our spoons in to get the first bite. I think what both Jeff and I appreciated the most about this dish was just how light it felt off our spoons. While the pulp from the corn and touch of flour added body to the chowder, it didn't end up being overly thick and dense, which was most pleasant on this warm summer day. However, if you are after a thicker dish, think about smashing in some of the tender potatoes first before trying to add more flour. Light on the tongue doesn't mean this wasn't exciting in the mouth as the delicate curls of shrimp and pure sweetness of the corn definitely demanded our taste buds attention and left them sighing in content by the time our bowls were clean. Our berry beds have finally slowed down for the season, though we are still getting random half-pound worth of pickings every few days... they have still been just as sweet as the first batch though! Our freezer is completely stuffed with strawberries now, with our total poundage picked sitting at 54 and a half pounds. I bet they will sure brighten up the days when we are in the dead of winter (which I really don't want to think about)! 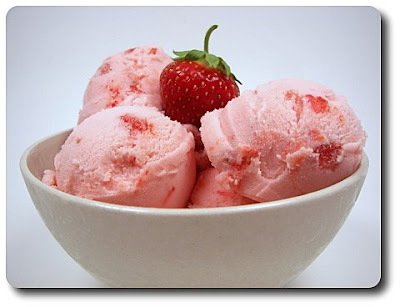 We couldn't let the strawberry season pass us by without getting out the ice cream maker, now could we? 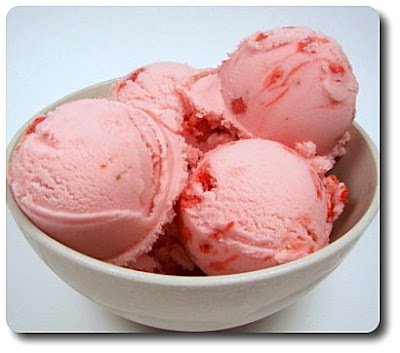 We made sure the canister was in the freezer and ready to go so we could make this Strawberry Sherbet! 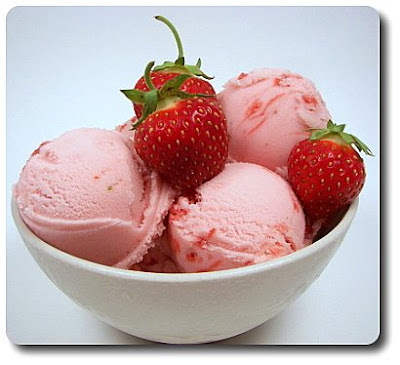 The strawberries are used in two ways for this sherbet, the first being laced with sugar and pureed smooth once the juices had dissolved the sugar granules. To keep this part ultra smooth, we did strain away the tiny seeds before continuing on. Is that a must? Not necessarily, but I think it helps with the appearance. Since the berries are plenty sweet already, instead of using plain milk as the majority of the liquid, sharp buttermilk is used, which helps keep the balance in check. If you do find your berries are not up to par, you may want to think about increasing the sugar slightly to give them a boost. To improve the mouthfeel of the sherbet, a bit of half-and-half was also poured in, along with a couple squeezes from a lemon, a splash of vanilla and a pinch of salt, rounding out the base with a fragrant note. To ensure this can churn properly and you end up with the best texture, this pink base will now need to chill for a couple hours before pouring into an ice cream maker. Remember how I said the strawberries are used in two ways? Once you've added the base into the maker to begin firming up, when there are just about 5 minutes left to the process, the remaining chopped berries are added so they retain their shape and freshness. You could serve this right away with a soft serve quality, but I scooped it into another bowl and let it ripen in the freezer before we started dishing it out. If it ends up sitting in the freezer for awhile, you will want to let it soften slightly in the refrigerator first as the sherbet will be quite firm. Just sweet enough, with a luscious tang from that thick buttermilk, Jeff and I found this incredibly refreshing and quite light on the tongue. 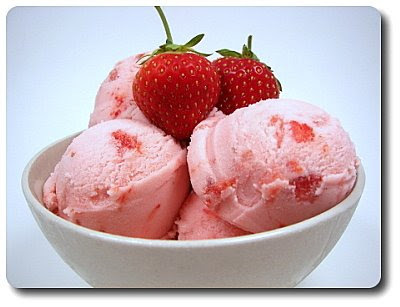 The one quibble I have was about those chunky bits of strawberries added in at the end - I can see why the recipe does this for appearance and flavor, but since the berries are full of water, they end up as little icy chunks that were a little distracting in texture to me. While dense, cream-laden ice creams will always have a home in our freezer, this was definitely a nice change from the norm with its uniqueness and you can bet we were sad when we went to grab the bowl out from the freezer again only to find we left not barely a serving in the bottom. We did try to split what was there, but I think Jeff stole more than his fair share... hmph! Back again for another Friday Night Pizza! 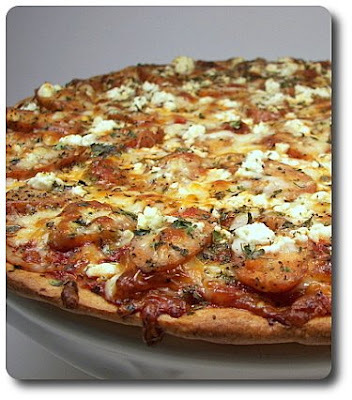 We sure have expanded our pizza list since we've started this weekly deal in our recipe section haven't we? 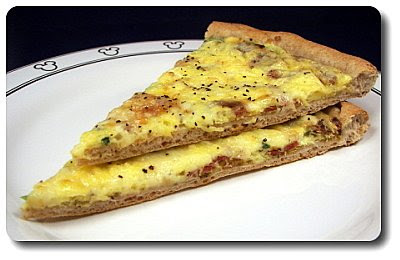 This week, we took a look at what we would have for breakfast and put them in this Egg and Bacon Pizza! You know what I'm going to say already, don't you? Yes, we used that whole-wheat pizza dough for the base as we usually do... whether you buy the dough, use a different recipe or buzz up our favorite in your food processor, just jump in and start making your own pizzas! You will need to work with the dough a bit more than we normally suggest - once you have it stretched out, I'll suggest up front that you'll want to transfer it to a pizza pan instead of using a peel if you have one. You don't absolutely have to, but you will see why in a minute. Creating a thicker crust around the edge is important with this pizza, but it isn't tough to do - just roll the edge of the dough onto itself and seal it down, making sure the edge ends up higher than the center. Since there isn't a typical sauce on this pizza, we gave the crust a slight zing by smearing on a thin layer of Dijon mustard over the raw dough. Because the toppings won't take but a few minutes to bake, the crust is placed in the fiery oven to get it goin' so you won't end up with a soggy crust. You may not see much color on top, but take a peek under the bottom and take the crust out when you see it begin to take on a golden hue. 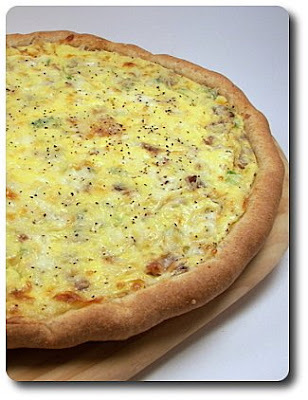 The pre-baked dough is then topped with crumbles of crisped bacon and plenty of sliced scallions for a mild onion-y bite. Whisked eggs, seasoned simply with fresh ground black pepper and a hint of nutmeg, were then poured over the top in lieu of a sauce (see why we needed that lip on the edge? ), followed by a mess of shredded Gruyère cheese. If you use the pizza pan as suggested, you'll have more stability as you move the assembled dish back into the oven with less worry of spillage. Gruyère can come across a little too nutty for some to enjoy, and is also fairly pricey, so don't be afraid to cut some of it with a milder Swiss or even mozzarella if you like. 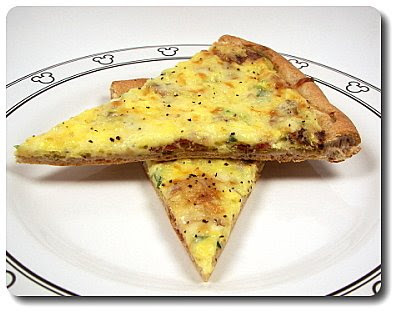 Since the crust was already started, this needs to go back into the oven just long enough to set those eggs and melt the cheese on top. Salty bacon bits underneath and puffy eggs on top, this was definitely not your ordinary pizza, but who wants to stay vanilla? 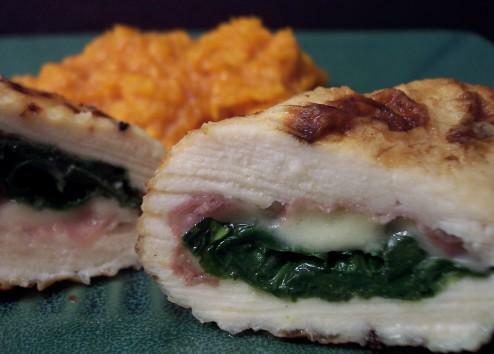 If you wanted to change this up, try using Canadian bacon or ham instead of regular bacon, or maybe think about adding thawed frozen spinach for a Florentine spin? With all those breakfast ingredients piled on top, Jeff and I did our best to hold back and not go too crazy with the servings tonight... for no other reason than we wanted an excuse to have enough leftovers for tomorrow morning! Pizza for breakfast? You bet and not one ounce of guilt since we'd probably have some form of eggs, bacon and toast anyway! We had a breakfast-for-dinner night recently and guess what? Our strawberries made yet another appearance! Here I thought we'd have way too many recipes for the strawberries we would get, but now I think it has become the other way around... hee hee! 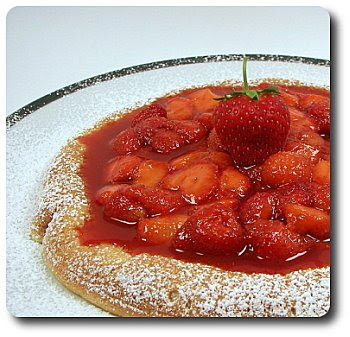 Think of this Warm Strawberry Puff as an family-sized egg-y pancake, holding up a pool of juicy strawberries just waiting to dribble down your chin. Since there are no leavenings used and you don't want to end up with a heavy puff, this dish can be considered a little fussy because you need to separate the eggs and beat the whites separately, whipping plenty of air into them with a touch of granulated sugar. You don't need to take them to a firm peak though - a soft, weeping peak is what you are after. If you've never had to beat egg whites before, just remember you'll want to use a bowl and whisk that are free of any grease - also, if you can have your whites at room temperature, they'll beat up quicker and allow for more volume. The golden yolks, separated from the above whites, are then used in the batter, along with a bit of cream, vanilla, melted butter and just enough flour for structure. Gently folding in the whites, the batter then goes into a heated skillet to begin cooking. As this is fairly thick, it won't cook as well on top of the stove - to make sure it can cook through without the bottom burning, the skillet goes into the oven after a few minutes and is allowed to finish with the even heat circulating around. While waiting on the puff to, well, puff, the topping was thrown together by melting together butter, Golden Syrup (you could use Brown Rice Syrup or even Corn Syrup if you don't have this) and a bit of granulated sugar. Heated just until it comes to a boil, melting the grainy sugar, halved fresh strawberries were stirred into the syrup with lemon juice and a heavy pinch of cinnamon for its sweet fragrance. You are not trying to cook the strawberries down here at all, just warming them through and coating them in the sticky topping. 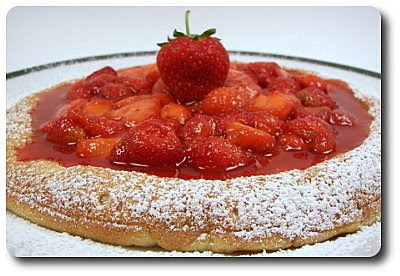 Just as that was ready, I heard a ding for the pancake puff in the oven - you could serve this right out of the skillet if you wanted, but we turned it out so we could spoon that strawberry concoction over the top. With a dusting of confectioners' sugar around the edge, this dish would surely stand out with its appealing presentation on your table! 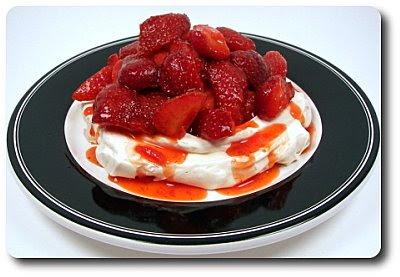 While we made this with strawberries, you can be sure this is on my list to make again, with apples, after we have done our traditional trip to our favorite orchards in the fall, picking them right off the trees ourselves! 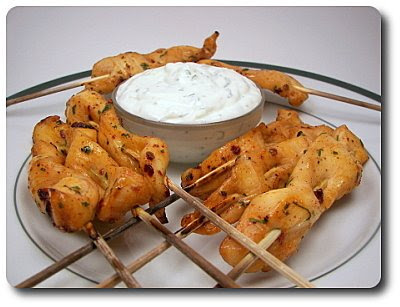 Tonight's dinner, Chipotle Chicken Skewers With Creamy Cilantro Dipping Sauce, would make for a fine appetizer, but rather than having just a skewer or two, we loaded up our plates and figured it would be good enough for a main dish! Think a sweet heat when it comes to these skewers, started out by letting strips of chicken breasts knoodle in a brazen marinade. With its molasses tones, brown sugar gave us the sweet, while a minced chipotle chile, along with a spoonful of its piquant adobo sauce, forced a smoky heat into the pool. Rounded out with chili powder, garlic powder and fresh cilantro, along with salt and fresh ground black pepper of course, you'll want to let the chicken hang out for at least a half hour, but if you plan ahead, a day in the refrigerator would be even better - I ended up tossing this together last night before going to bed to get it out of the way. Before I even brought the chicken out, I gathered our cream, mayonnaise, fresh lime juice, a clove of garlic, cilantro and a couple scallions, which work together to create a tranquil dipping sauce. To give the ingredients time to dance and get to know each other, I let this hang out while I got my hands messy threading the chicken strips onto the skewers. You can also prepare this ahead of time if you like - I would have gotten it done last night, but apparently I forgot to add sour cream to the market list and had to run to the store this afternoon (sigh...)! I do suggest giving it a quick taste before you serve it - if it sits too long, the flavors may dull slightly. To perk it right back up, squirt in a juicy lime half to refreshen. Grilling these would be a fine option, but we opted for the broiler tonight. Soak the skewers first if you like, but with the heating element just inches away, it is best to just cover the ends of the skewers with foil and be done with it. With the chicken soaking in a bit of the heat from the chipotle, pairing it with the citrus-y white elixir tames the spice with its bright, cooling nature. Adding the rich brown sugar into the marinade also does well to off-set the bite, but I was more attuned to the attractive lacquered finish it gave the moist broiled strips. Flavor-wise it was spot on, but where the real bonus points come in was the fun element of throwing the chicken onto skewers and making for an interactive dinner - who doesn't love to dunk?! I know we just did a blueberry treat last week, but tis the season and those juicy berries were too hard to resist picking up more. 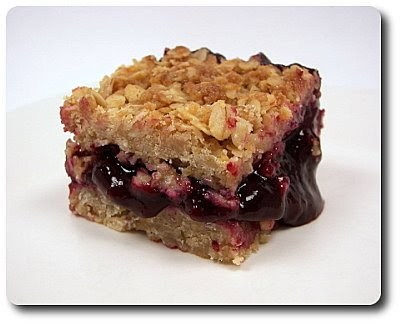 The blueberries are definitely more prevalent in this week's Wednesday Treat Day though - unlike being more garnish-like in those sandwich cookies, these Blueberry Oatmeal Squares take them center stage! Since the thick filling needed to cool down and hang out in the refrigerator for awhile, I made sure to get that out of the way early this morning. Thankfully, in my morning haze, all I had to do was toss the blueberries with sugar and freshly squeezed orange juice in one of our saucepans. Once I had brought it up to a boil, then eased the heat back to let the trio simmer, the blueberries bounced around to become tender and start to burst, releasing their tart juices. Which happened to be just enough time to get the dogs up, fed and outside! It was plenty loose at this point, which wouldn't make for a good bar cookie filling, so adding a bit of cornstarch (mixed with water first to ensure no lumps) was supposed to do the trick to tighten up the excess liquids (more on this in a bit). Just be sure that the blueberry mixture sits at a full boil for a minute or so to make sure the starch activates. Transferred to a bowl, the quick jam-like filling is then covered with plastic wrap (taking care to make sure the wrap is directly on the surface to prevent a skin) and left in the refrigerator to chill down. When I finally was ready to get the bars going, all I needed to do was quickly get the oat crumble together and it was ready for the oven! Hearty old-fashioned oats, flour, rich brown sugar, a bit of orange zest (since we used the juice in the filling!) hold down the fort as the dry ingredients and to bring them together, a mess of cubed butter was added to be cut in with a pastry blender. If you wanted to haul out a food processor to do this, by all means go ahead, but I didn't want to dirty that up today. You are not trying to form a dough per se, you're more looking for the mixture to resemble coarse crumbs instead of a smooth dough. Half of it was patted into a baking pan, followed by that cooled blueberry filling to be spread over the top. 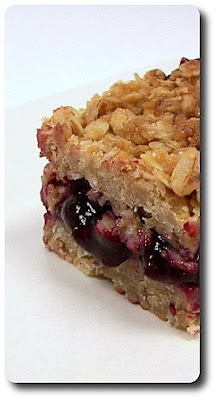 The remaining half of those oat crumbles was scattered on top, using a light hand to press them in slightly. You want to bake these long enough to bind the oats together, letting them turn golden and slightly crispy. Not the easiest request, and I know it was quite hard to do myself, but you don't want to slice these into bars while warm as the filling would not have had time to set up. So, try and let them cool completely first. After what felt like an eternity, I cut out a couple squares for us to test (a requirement, you know!) and was first very pleased with how vivid and striking the filling ended up. However, apparently the recipe was short on the cornstarch (or our berries were extra juicy!) as my filling was a little more oozy that I expected - even with a stint in the refrigerator, the filling didn't seem to hold together as much as I would have liked. That buttery oat top and bottom crust surrounding the filling, with its brilliance of blueberries spiked with orange, a smile hastily displayed on my face as I reveled in my portion of this sweet, decadent treat. And, even though there was plenty of butter involved (I'm sure I made Miss Deen proud), I just told myself there were plenty of antioxidant-rich blueberries and vitamin-filled orange juice that we could label this a healthy snack! I realize that's a stretch, but it works for me. They ended up being pretty messy to cut and eat (and no doubt trouble to bring into the office tomorrow! ), however, I bet no one will mind as they will be too busy licking their fingers clean to care! 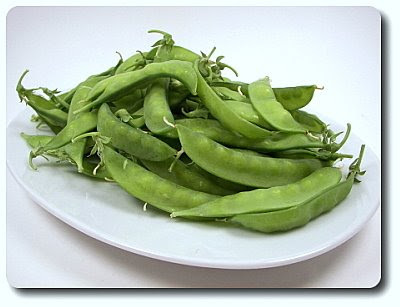 Our two types of pea plants (sugar snap and snow) have been doing quite well and we've even been able to place a couple pounds into the freezer for use later on. When I noticed that they have now surpassed my height, I wondered just how tall they were - we went out and measured this evening and a few of them have even managed to crawl themselves up to seven feet tall - crazy! 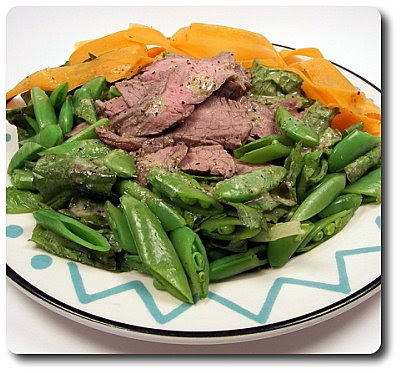 We actually prepared this recipe, Steak Salad with Snap Peas, for dinner a couple weeks ago just as they began ripening and producing their wealth of pods. While I was waiting for the broiler to get itself up to temperature, I sat myself down at the island and started trimming and halving the peas. Mindless work that doesn't always thrill me, but I've found I have started looking at it in a new light now that we've been growing them ourselves - I guess it's the sense of accomplishment? Once I had the pile of them prepped, we seasoned a halved flank steak and gave it a fairly short stint under the broiler, finishing it off to a nice medium-rare. If you wanted the steak to have a more intense flavor, certainly let it hang out in your favorite marinade before broiling - a marinade would also benefit it by tenderizing the meat a bit, but neither of us found it especially tough since it wasn't overdone. As with most meats, giving it a required rest before slicing into it is recommend - which gave us plenty of time to finish this speedy salad! 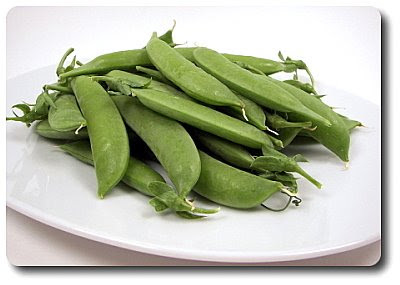 To take off the raw raw edge of the peas, they were steamed for just a couple minutes, then shocked under cold water to stop their cooking, leaving them crisp tender with a ravishing bright green color. An innocent, but powerful dressing, was up next by whisking together fruity olive oil, white wine vinegar, a generous dollop of Dijon mustard to emulsify and a clove of raw garlic for bite. Rather than just dumping all the elements into a big bowl and tossing them together, this salad was more about being a composed dish. To ensure the dressing would be able to evenly reach all of the components, half of it was first used to coat a head of torn butterhead lettuce before evenly arranging the leaves on our serving plates. The rest? You'll see! 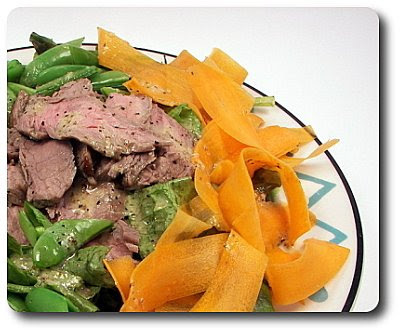 The steak, which we had then thinly sliced across the grain, was mounded in the center and surrounded by the snap peas and thin orange ribbons, thanks to a couple carrots and our handy peeler. The recipe did call for radishes, which would have been nice for a peppery contrast, but alas I completely forgot to pick them up and by the time I realized it, it was too late! *Mental note - be sure to add them to the garden next year. That tangy dressing we held back was then brought into play by drizzling it all over the top, imparting itself over each ingredient. While fresh and light, we found this colorful salad to still be plenty filling thanks to the added steak and bulky vegetables. I did find myself missing that radish though, not only for flavor, but for the pop of red and white contrast it would have added to the visual appeal! One of the first (of many!) 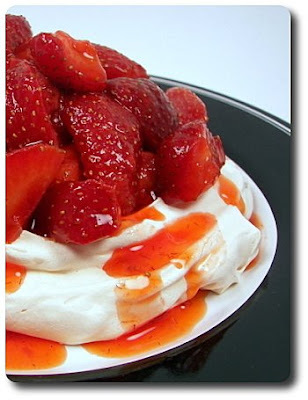 strawberry treats we made when we started harvesting our crop were these Meringue Nests with Macerated Strawberries. I wanted a treat that was pretty simple and let the strawberries scream with their natural sweetness. The only work needed to prepare this is making the nests, which are just egg whites beaten with granulated sugar until the mixture formed stiff peaks. There were a couple additions to help that process along - cream of tartar and a pinch of salt. The cream of tartar helps stabilize the whites as they beat and I find I usually end up with better volume results. That pinch of salt? It helps to cut the sweetness of the meringue itself. Before you jump in with that though, be sure that your egg whites are at room temperature - also, the bowl and beaters that you will be mixing them with should be very clean and free from any fat. This aids in giving the egg whites the best environment to explode in size. Once the bright white meringue held firm peaks, we added a dash of vanilla and divided the now-stiff whites into four piles on a baking sheet (lined with parchment paper - a silpat would work too). Shaped into nests, with the sides higher than the center, the meringues were then baked until they were dry and firm to the touch. Don't take them out at this point though - turn the oven off and let them sit tight for a while to finish drying out the thicker edges. To put inside these airy, crisp shells, we hulled and quartered a generous mound of our fresh berries, then tossed them with fragrant vanilla sugar I've had brewing in the pantry. The sugar isn't there so much to sweeten them, but is used more to draw out their juices, creating a thick syrup to glaze them in. This light treat was refreshing, uncomplicated and pure - a perfect way to show off those brilliant summer berries. Where did summer go again? Not that I'm complaining or anything, but it is kind of crazy that we are in the middle of July and the high today barely reached 60 degrees... the chill in the air was refreshing, but dang! At least I didn't have to worry about heating up the house by making this Three-Cheese Pizza with Chicken Sausage for our Friday Night Pizza! Chicken sausages come in an array of different flavors and I don't think you could go wrong with any of them in the pizza - we used a spicy variety that was studded with sun-dried tomatoes. Just to deepen their flavor, we did grill them off first in a grill pan to heat them through and give them a caramelized finish. While those were cooking and cooling, I put my my fingers to work by stretching and pulling our favorite whole-wheat pizza dough into a large, rough circle. Use a rolling pin if you wish, but one of the reasons I love this dough so much is because of how malleable it is to work with - we can even get it quite thin when we want without it tearing into a mess of holes. Enriching the dough with a hint of garlic, and also helping it gain a sharp golden color, and we gave the round a good rubdown with garlic oil just before we slid it onto a heated pizza stone for a quick head start to the crust. Once the bottom began to turn a light color, I swept it off the stone and turned it uncooked side down onto a rack. Turning it over like this allowed me to brush the once-bottom of the crust with a bit more garlic oil (bonus flavor! ), and will also eventually give both sides contact with the stone for the best crispness. Smearing a healthy amount of sauce on top gave us a base to start sprinkling on a blend of aged provolone and shredded mozzarella cheeses. When those sausages had cooled down enough handle, we gave each a quick link a quick run through with a knife, on the diagonal, leaving us with slick sausage "coins" to layer over the pizza. More of those two cheese went on top, adding to the gooey cheese factor, along with nuggets of feta for its mild, yet salty edge. Before going back into the oven, a smattering of dried oregano seasoned the top of the pizza, lending its warm, aromatic note to each upcoming slice. Since the crust had already been jump-started, don't stray too far from the oven - it won't take long to melt those shreds of cheese together! If you're a grill fan, you could certainly do this entirely on it too if you prefer - from cooking the sausages, pre-cooking the crust and finishing it off in one swift movement (just be sure to move it to a cooler section of the grill so the crust doesn't get too charred). If you've never tried pizza on the grill, it is definitely worth giving it a go, especially when you want to impress your guests or it is just too warm to turn on the stove (not that we've had that problem lately!). 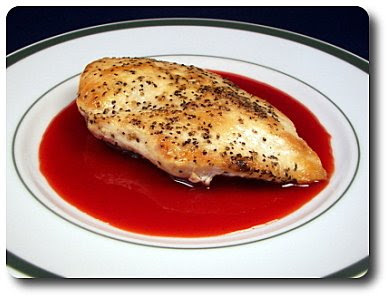 I'm back tonight with another strawberry recipe, however this time they went into a savory dish that we prepared for dinner - Gorgonzola-Stuffed Chicken Breasts with Strawberry Gastrique! Pretty swanky title, no? This gastrique, which is just a lavish term for a syrupy reduction, does take some time to cook down, so this is where I steered my attention right off the bat. Strawberries, smashed with sugar, sherry vinegar, broth and a sprinkling of ground coriander create the base of the sauce and are left on the stove to simmer down, concentrating the flavors and thickening the mixture. If you have problems locating sherry vinegar, which I have in the past, I'd use a red (or white) wine vinegar, which seems to be more commonly available. Because you don't want any obtrusive elements, once it was ready, we pressed this mixture through one of our sieves, making for a luscious, silky sauce. Since that took a good half hour to reduce, I was left with plenty of time to get the chicken breasts stuffed! Before getting my hands covered with chicken juices, I stirred pungent crumbles of Gorgonzola cheese, fresh thyme and chopped prosciutto together, creating the cheesy stuffing. You could slice the chicken in half, opening it like a book to get this combo inside, but I find it easier to just use a thin, flexible knife to cut a two to three inch opening, then moving the knife back and forth around the inside to make a pocket. This way it leaves most of the chicken breast intact and I find it tends to leaks less, keeping the filling in as the chicken cooks. If you want to sear the chicken on one side and finish it in the oven, by all means go for it as the chicken is fairly thick - however, since it didn't have any breading to it, I found it was just fine where it was. After browning the chicken on one side, we simply flipped them over and covered the pan, trapping the heat in and allowing you to turn down the flame. They can then cook through without needing to be constantly tended to or risk scorching, leaving you with succulent white meat that defies its typical dryness. You could present this a couple ways - serve the chicken whole on a pool of the ruby sauce as we did (I was in a hurry to eat, hence the single picture! ), or if you wanted to take a more striking approach, slice the chicken crosswise and then drizzle the sauce down the middle and around the sides once plated. There was enough sauce that each piece of chicken I sliced off was able to get in on the action, but darn it if I didn't find myself licking the plate to get each and every speck of it off! Next time I'd make one and a half times the amount, because selfishly, I just wanted extra for myself! What I appreciated about the sauce was how balanced it was - the strawberries and sugar brought the sweet, the vinegar delivered with its tart notes and to bring the two together for this savory dish, the broth played anchor so neither overwhelmed. Jeff saw my pile of little green pearls on the counter and said "oh geez, those darn lentils again?". This time I got to roll my eyes and reply "Again? I haven't used them since November of last year! Give me a break!". Hee hee... just one more case of his "pretending" to not like an ingredient, yet in reality he does and just doesn't want to admit it. What's with that anyway? He was correct though, that is what was in the bowl as I was getting ready to prepare this Lentils with Chicken Sausage dish for our dinner tonight. While you could take your time and finely chop the vegetables that go into the pot, as the lentils were swimming in the broth waiting for it to boil, I added the carrots, celery, onion and a couple cloves of garlic into the food processor and let it do the work. You're not looking for a paste here, so use the pulse button to break them down. To bring them to life before plunking them in with the lentils, we softened them in a skillet with a drizzle of oil and a few sprigs of fresh thyme snipped from our herb bed on the deck. By the time the veggies were ready, the lentils were just shy of coming up to a boiling, which was a good point to stir them into the mix. 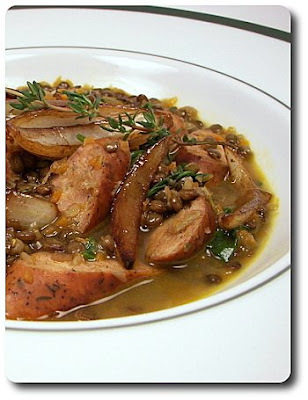 Because you want the lentils to retain their shape and have a firmer texture in this dish, they won't take too long to cook through. However, this isn't idle time as there was a bit more work to do! To bulk up the dish with a meaty edge, we started browning links of chicken sausage (the pre-cooked kind... we chose a spicy variety! 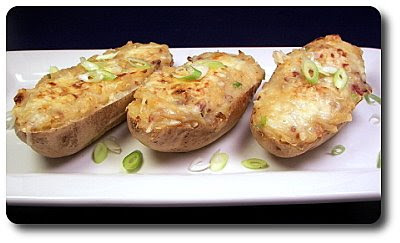 ), along with wedges of onion. As the onions cook, the wedges gradually soften and slightly caramelize, leaving you with sweet petals that end up being threaded throughout each serving. Punching this combo up with a tangy burst, dark balsamic vinegar was drizzled in the skillet, coating the sausages and onion in a glaze as it quickly thickened from the heat. To allow for easier eating and a nicer presentation, the sausages were then thickly sliced on the diagonal before being added back in. Now that the lentils were ready, I noticed there was quite a bit of liquid left behind - I wasn't really expecting that, though I guess I should have given the proportion of broth to lentil. This is mainly because in one of the pictures I saw of this recipe prepared, it didn't seem to be a soupy dish. Jeff asked if we should just drain it away, but I figured why bother because it was rich and full of flavor now! Before I added the sausages and onion in with the lentils to finish this off to serve, we did toss in a handful of tender baby spinach for a bit of freshness. 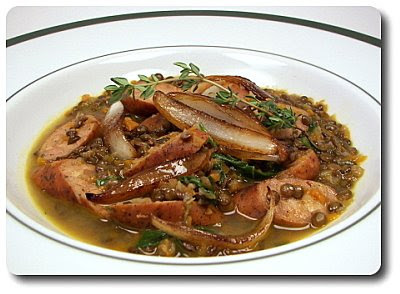 While we (yes, Jeff indeed gave this a thumbs up, even with those "evil" lentils!) thought this earthy dish was definitely tasty, because of its heartier nature, I bet this would be even better served on a cold winters night as a way to warm oneself from the inside out! 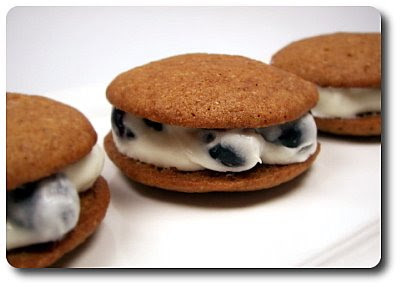 I'll be right upfront that these Blueberry-Spice Sandwich Cookies that we made for the Weekly Wednesday Treat Day started out with another name... they were labeled as "whoopie pies". 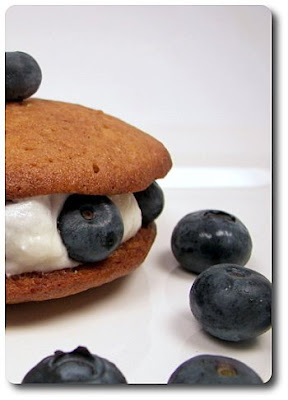 While technically they could considered one, a whoopie pie to me shouldn't even think of having a fruit-y component in the filling. So, we'll go with sandwich cookie and then we don't have that problem anymore, right? I know... a little over the top, but some things should remain sacred - hee hee! For these cake-like cookies to get started, the dry ingredients are pepped up with warm spices - cinnamon, ginger, cloves and fresh grated nutmeg. It's funny because as soon as I have the jars lined up for these types of add-ins, I always quickly remove their screw lids, then shake each one a little bit so the dust that sits inside rushes out and releases their fragrant aromas around me. It seems to whisk me away to the slow moving days of fall, apple picking time and and the start of the my favorite holiday seasons. Since the dry ingredients were given a boost, the wet ingredients deserved a little help too, which came in the sticky form of molasses being beaten in once the butter and brown sugar were creamy and smooth. The dry ingredients were mixed in alternately with a scoop of tangy sour cream - besides adding moisture and tenderness, the sour cream has the acidity the baking soda needs to activate, allowing the batter to spread and puff as it bakes. 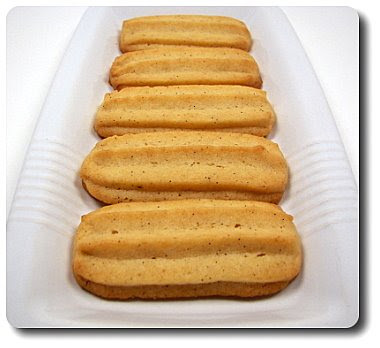 The billowy batter ends up being thinner than a typical cookie dough, but is still thick enough that it doesn't turn into a puddle as soon as you portion it out. Testing for doneness is thankfully quite easy - as soon as the rounds are lightly golden and you lightly press a finger into its center, the cookie will spring right back when its ready. If the indent from your finger remains, the cookies need a bit more time. Once done and the cookies are off on their racks cooling themselves down, I got right to work on bringing the filling together. To stick these cookies to each other, the filling was a very unadulterated combination of cream cheese and one of my all-time favorite ingredients, marshmallow fluff. Yes, you can use marshmallow crème if you must, but what can I say, I'm loyal to my fluff! 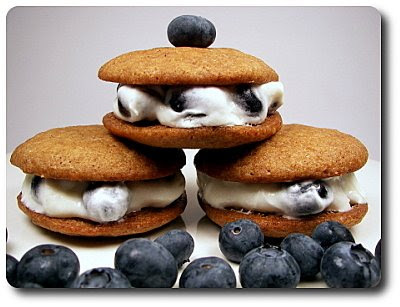 What adds the colorful, unexpected element into these sandwiches are fresh, bouncy blueberries! Even though I'm a big fan of blueberries (eating at least a cup a day in my yogurt), they still did seem a little out of place at first... but after sneaking out a spoonful of the filling, enjoying the contrast between the smooth filling and the juicy burst of the berries, my mind was scrambling to come up with a reason why this shouldn't work! Cutting the fluff and cheese with the tartness of the berries was a novel riff on the filling and I can now see why they found a good home with these cookies. 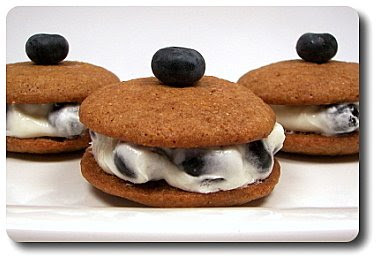 While the filling is studded with those blueberries, it does wash them out and make them not look as appealing as they could - for a little more drama and just because we had plenty to go around, we pressed a few clean berries around the edges of each stuffed sandwich. However you want to name them, this treat with its soft, cake-y cookies, laced with aromatic spices and then loaded with a decadent, yet light filling, is definitely worth the time needed to construct them. Wrapped up in individual cellophane packages, I bet they would also be a fine addition to any bake sale table! While I was preparing a main dish tonight that doesn't really have a recipe, I did make a new side to go along with that I can share. 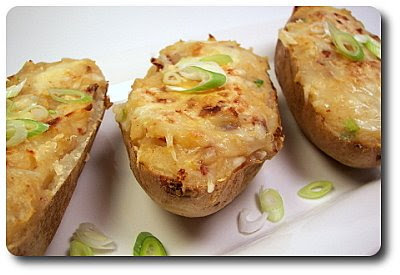 Baked potatoes are always a hit around here, simply split and topped with a little butter, salt, fresh ground black pepper and sometimes with a dollop of tangy sour cream, so I knew these Bacon-Chipotle Twice-Baked Potatoes would definitely go over well. After working with them so much, the potatoes have pretty much cooled down by now. To warm them back up, we placed the filled potato halves into a small baking dish, topped each with a bit more cheddar (love our cheese!) and placed the dish into the oven. If you knew you would be strapped for time, you could do most of this ahead and stash the assembled halves in the refrigerator - just add a few extra minutes to the baking time. Also, if you had a chance to make these ahead of time when you know you would be grilling out for dinner, they would a perfect choice to warm up on the grill instead of using the oven! Smoky with a well-enjoyed burn, since you do already have bacon on the inside, you could leave out those chipotles if you can't stand their spicy bite. Or, perhaps, just toss in a bit of the adobo sauce they are packed in as a compromise! If I wasn't serving this as a side, I'd be quite tempted to have two portions of this and just call it dinner - carb-laden perhaps, but I know I would be satisfied! After looking through the past six new recipes we prepared this week, we tapped the Strawberry-Almond Cream Tart, those Spinach and Feta-Stuffed Calzones and that Basic Strawberry Fruit Leather as our favorites. Now, here I go again... making a dish that was intended to be a side and bulking the ingredients up, stretching it into a main! 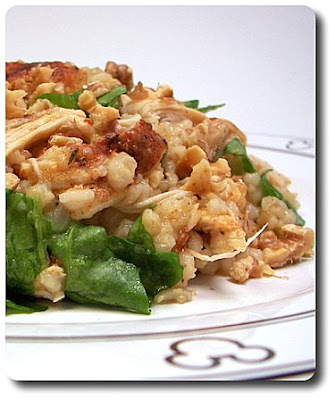 Which actually didn't turn out to be tough at all to do with this Spicy Barley and Rice with Chicken. To give the base a jump start, we softened onions in a bit of olive oil just before adding a couple cloves of minced garlic. To give the barley a toasty edge, ramping up its natural nuttiness, we stirred the dry grain into the pot and let it work with the heat to give each piece a golden tone. For enough liquid to cook the barley, we used a combination of water and broth - you could use completely broth if you like, but splitting the two is a great compromise, especially since we go through broth like crazy! 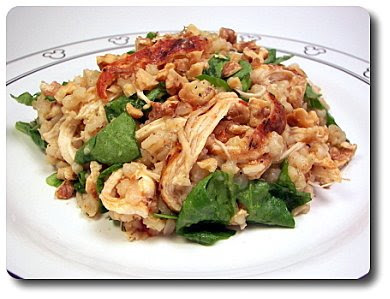 The proportion of the liquid to barley may seem a bit much at first, but that's because the recipe also calls for tossing in a bit of brown rice, lending a heartier nature to this dish. For a bit of spice, minced chipotle pepper was added, with a touch of the accompanied adobo sauce to overlap the smoky aspect. Since we were using brown rice and pearled barley, rather than quick-cooking you might find at your market, be prepared for a good forty to forty-five minute down time to soften up those hard grains. The pot is almost ready when the barley is tender and almost all of the liquid had been absorbed, but not all of it as this will sit off-heat for a few extra minutes to warm through the addition of a few cups of shredded cooked chicken breast. And because our thyme plants are actually doing well in our herb box on the deck, we tossed a few of the tiny leaves in to permeate through. If you opt for using dried thyme instead, go ahead and toss it into the pot when you add the liquids. Just before serving, we brought color and freshness into the mix with hand torn spinach (which, sadly, was the last from the garden as it has gotten way too warm out lately! 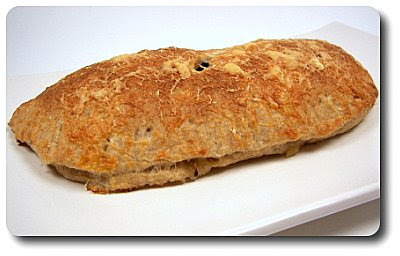 ), along with toasted walnuts for an omega-3 boost and textural crunch. Not too spicy as is, you could intensify that by a bit more chipotle, or as we did, by seasoning the with chicken breasts with spicy blend before cooking it. We also quite liked how even though most of the liquid was absorbed, there was enough leftover that worked with the starch in the barley to not necessarily make a sauce, but coat this healthy dish in a shiny glaze that kept the grains moist without being wet or gloppy. And the strawberry treats keep coming! I can't begin to tell you how many berries we have eaten out of hand (we have the red-stained fingers to prove it! ), but I do know we've picked over 45 and a half pounds, 27 of which has been tucked away in the freezer for use later. 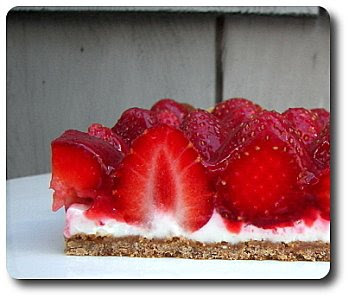 While they haven't been producing the giant berries that they did at the beginning, the medium to small ones were fitting for this Strawberry-Almond Cream Tart. 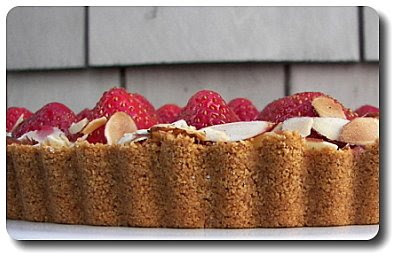 A basic homemade graham cracker crust lined the base of our tart pan, consisting simply of graham crackers (cinnamon! ), granulated sugar, a dash of salt and enough butter to make the mixture feel like wet sand. You know, it will clump together if you press it in your fingertips, but is not so wet that it ends up being greasy and sticky. A food processor makes quick work of this, but a trusty rolling pin, a zip-loc bag and a bowl would work just fine - smash the crackers inside of the bag, then stir everything together in the bowl. Even if you do have a food processor, the latter might be good option to get out any pent-up aggression! Since the assembled tart won't be baked, once pressed into the pan, the crust goes for a stint in the oven to force those crumbs into a firm, golden crust. You can't see it yet, but underneath those beautiful strawberries is a slick layer of cream cheese, lightly sweetened with granulated sugar and amped up with vanilla and nutty almond extract. For the best spreadability, be sure your cream cheese is at room temperature, rendering it quite soft - this way you won't risk tugging at the crust underneath as you smear it over. As soon as we arranged the whole, hulled berries neatly on top, we brushed a thick strawberry glaze on top for shine and well, for more strawberry bang! This is done by heating pureed strawberries with a touch of sugar and potato starch (cornstarch would be fine) until it comes just to a boil, activating the thickening power of the starch to tighten the puree. 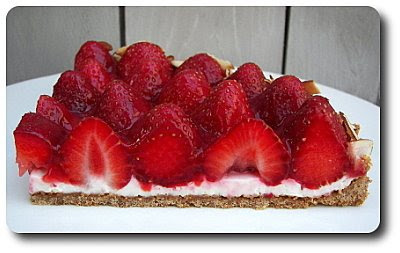 This gives it enough body to cling to the berries, yet still flow to cover the open spaces of the tart. Because we didn't want any distractions to the puree, we did press it through a sieve for an ultra silky texture - this is an extra step, but one that is up to you. Just when you think we're done, we have one more touch that brings it all together - around the edge of the tart, thinly sliced almonds, which were first toasted, were sprinkled around tying the almond from the crust into the top with a bit of crunch. While it was tempting to slice right in, the cream cheese is so soft at this point it would end up being fairly messy. Chilling it in the refrigerator for a few hours does the trick so you are able to retrieve clean slices. Impressive enough as is with those plump berries circling in the center, if you wanted to be especially fancy, you could slice up all of those strawberries and working from the outside in, layer them in a tight fan for a flashy finish. Best on day one, this was still very good on day two - the only issue comes from the crust softening underneath the moist cream cheese layer. I especially liked the cinnamon crackers in the crust, but you could of course use honey or if you can get your hands on them, chocolate grahams! 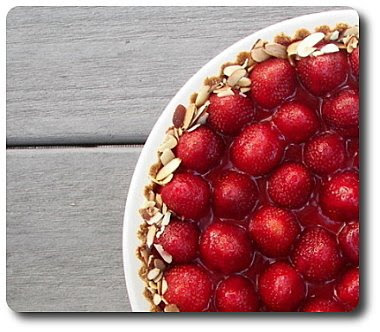 This is one of those recipes that will instantly come to mind when I'm looking for the perfect summer dessert that is fresh, unique and doesn't require a ton of work to pull it off. Jeff gave me one of those puzzled "are you sure this is going to work?" looks when I rattled off the filling ingredients for these Spinach and Feta-Stuffed Calzones we made for our Friday Night Pizza. I shrugged and just replied with "I guess we'll just have to wait and see!". Yeah, I then caught him rummaging through the pantry to see what he might be able to scrounge up in case this went south... no faith I tell you! I don't think that the spread I had laid out on the counter was all that odd, but I think what threw him was one of my largest bowls literally overflowing with greens with a smaller dish of golden raisins beside it. Yes, there be dried grapes in these calzones! 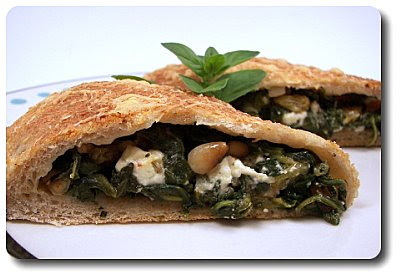 To get the filling ready to stuff in our favorite whole-wheat pizza dough, I started grabbing handfuls of the greens, a combo of tender baby spinach and peppery arugula, and throwing them into the skillet were I had softened a bit of onion and a few cloves worth of minced garlic. It didn't take long for the heat to widdle the greens down to almost nothing, which is why we needed that filled bowl to begin with - I think Jeff forgot about that and gained a little confidence when he saw the end result. Those plump golden raisins then went in (which got an eyebrow raise! ), along with buttery toasted pine nuts, fresh oregano, a pinch of cayenne pepper for heat and a splash of fresh lemon juice. 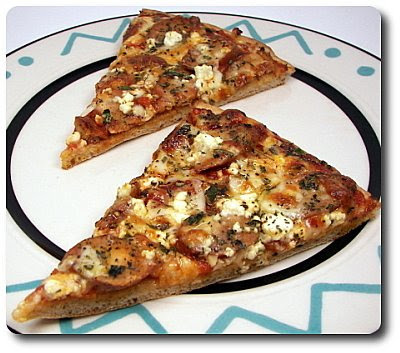 Set aside to cool down a bit, we then added the crumbles of feta cheese - plain feta is fine, but if you wanted to push in a little boost, try one that comes flavored with dried tomato and basil or garlic and herb. As you know, when you wilt down spinach (and arugula), quite a bit of liquid escapes - the original recipe didn't call for draining that away, but there was way too much in the skillet to not cause issues. I decided to just pull out the filling ingredients with a slotted spoon into a separate bowl, then add back just enough of the liquid left behind to keep it moist, yet not swimming in juice. Quartering the pound version of the dough, then stretching each out into a rectangle, was next on the list - I didn't get exact measurements here, but just eyeball how much filling you have to go in each and make sure the rectangle is large enough that you end up with plenty of dough to stretch over the filling. Assembled and sealed with the tines of a fork, the calzones were given a quick wash of milk and water to give some sticking power to the Parmesan cheese we sprinkled on top. Before being baked, be sure to give the dough a slice with a knife or poke with a fork on top - this gives the steam inside somewhere to go as it heats up and you won't end up with a blow out! 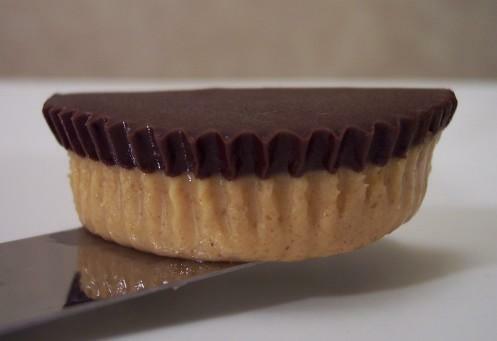 If you would like to make this a little easier on yourself, you could also just as well roll out the entire dough into a large rectangle, spoon the filling down one half and then enclose it with the uncovered half to make one giant version instead. The only thing you would need to watch out for is the baking time - you may need to extend it by a few minutes. Even with its golden, cheesy crust, I did have to take a bite of mine first before Jeff decided it would be okay to try. I told you, he can be quite finicky sometimes! While quite savory, the little raisin nuggets, bursting with their warm juices, added such a unique contrast of sweetness that I found myself quite attracted to. I can see how this could be a love it or hate it combination, but Jeff did comment how surprised he was that he couldn't keep from going for that next forkful - score! 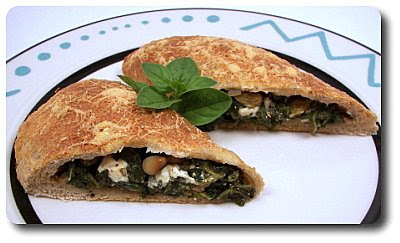 Even though there was a conservative amount of pine nuts added, the richness from those three tablespoons helped keep the filling balanced and interesting, while the crumbles of feta cheese led the charge with their challenging salty edge. One interesting dish indeed!